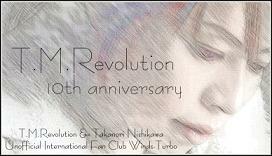 On September 19,2006 ,T.M.Revolution Special Day at Universal Studio Japan ! !T.M.Revolution holds the collaboration event with Universal Studio Japan of Halloween on September 19,2006 in the birthday of Takanori Nishikawa. Furthermore, as the final of this event,T.M.Revolution uses a stage of Neverland of Peter Pan and holds magnificent special Live Concert !! We will inform you about more information.